Ransom paid by a murderer to the avenging kinsmen of a murdered man, in satisfaction for the crime. Among the Anglo-Saxons and other Germanic peoples blood-money or "wergeld" was commonly paid, and a regular scale of prices fixing the value of lives was established by law (Kemble, "The Anglo-Saxons in England," ii. 276 et seq.). 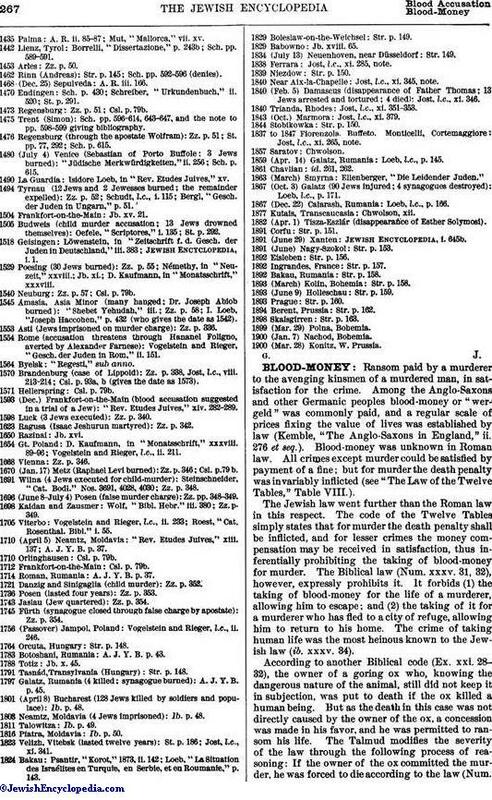 Blood-money was unknown in Roman law. All crimes except murder could be satisfied by payment of a fine; but for murder the death penalty was in variably inflicted (see "The Law of the Twelve Tables," Table VIII.). The Jewish law went further than the Roman law in this respect. The code of the Twelve Tables simply states that for murder the death penalty shall be inflicted, and for lesser crimes the money compensation may be received in satisfaction, thus inferentially prohibiting the taking of blood-money for murder. The Biblical law (Num. xxxv. 31, 32), however, expressly prohibits it. It forbids (1) the taking of blood-money for the life of a murderer, allowing him to escape; and (2) the taking of it for a murderer who has fled to a city of refuge, allowing him to return to his home. The crime of taking human life was the most heinous known to the Jewish law (ib. xxxv. 34). According to another Biblical code (Ex. xxi. 28-32), the owner of a goring ox who, knowing the dangerous nature of the animal, still did not keep it in subjection, was put to death if the ox killed a human being. But as the death in this case was not directly caused by the owner of the ox, a concession was made in his favor, and he was permitted to ransom his life. The Talmud modifies the severity of the law through the following process of reasoning: If the owner of the ox committed the murder, he was forced to die according to the law (Num.xxxv. 31); but if his ox killed a person, the ox was slain, and the owner paid blood-money. If the ox were not slain, then the owner was put to death; hence R. Ḥizkiyah said, "The law in Num. xxxv. 31 requires only the actual murderer to be killed; and you can not put a man to death because of a death caused by his ox" (Sanh. 15b). The murderer who had come to the city of refuge, if guilty of wilful murder, was given into the hands of the avenger to be executed; but if guilty of accidental homicide, remained in the city of refuge until the death of the high priest (Num. xxxv. 25). It appears, therefore, that even one guilty of accidental homicide could not expiate the offense by the payment of blood-money, but must serve his full term in the city of refuge (Ket. 37b). The strict application of this law led the rabbinical authorities to the conclusion that the death penalty was an absolute satisfaction for the crime and its consequences, and that therefore the relatives of the murdered person had no claim in damages against the murderer. The law in Ex. xxi. 22 was thus explained: "If there is no danger to life from the injury, the murerer is punished by fine; but if death results, he is not punished by fine, because he is subjected to the death penalty" (Mishnah Ket. iii. 2). 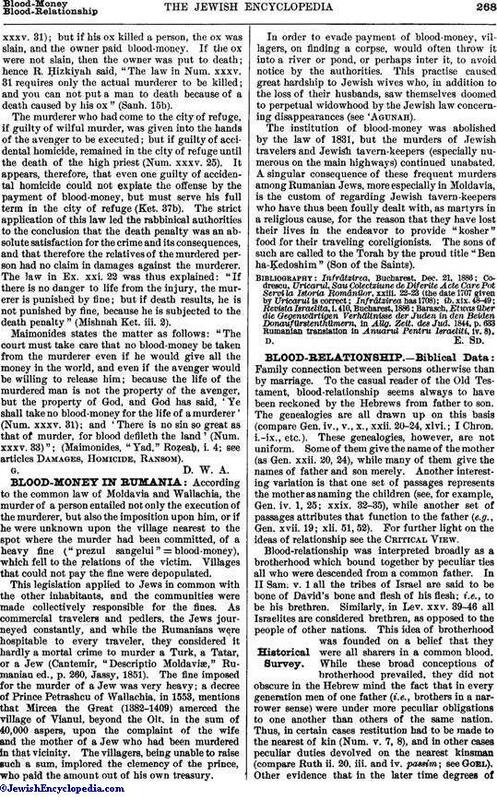 Maimonides states the matter as follows: "The court must take care that no blood-money be taken from the murderer even if he would give all the money in the world, and even if the avenger would be willing to release him; because the life of the murdered man is not the property of the avenger, but the property of God, and God has said, 'Ye shall take no blood-money for the life of a murderer' (Num. xxxv. 31); and 'There is no sin so great as that of murder, for blood defileth the land' (Num. xxxv. 33)"; (Maimonides, "Yad," Roẓeaḥ, i. 4; see articles Damages, Homicide, Ransom. ).